Stellar Wind, the champion sophomore filly of 2015 and a six-time Grade 1 winner, breezed for the first time as a 6-year-old Sunday morning as she continued preparations for an historic start in the Pegasus World Cup. 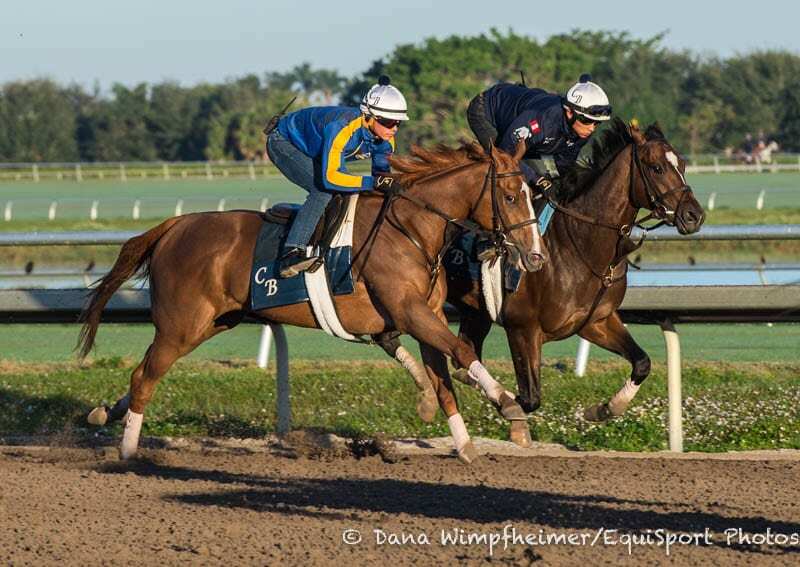 Expected to become the first female to race in the 1 1/8-mile Pegasus, Stellar Wind went five furlongs in 1:01.50 in company with Grade 3-winning 5-year-old Shagaf at Palm Meadows, Gulfstream Park's satellite training facility in Palm Beach County. Sunday's work was the fifth since joining Brown at Palm Meadows after being purchased for $6 million by Coolmore out of Keeneland's November Breeding Stock Sale. Initially bought as a broodmare prospect, the ownership partners decided to return her to training for 2018. Stellar Wind, a chestnut daughter of Hall of Famer Curlin, won the Santa Anita Oaks (G1), Summertime Oaks (G2), Santa Ysabel (G3) and Torrey Pines (G3) and was beaten a neck when second in the Breeders' Cup Distaff (G1) during her championship season for Hronis Racing and trainer John Sadler. She won the Clement Hirsch (G1) and Zenyatta (G1) and was fourth in the BC Distaff in 2016, and last year won the Apple Blossom (G1), Beholder Mile (G1) and repeated the Clement Hirsch before finishing eighth in the BC Distaff. Following the sale Stellar Wind was turned over to Brown, who worked her in company with the promising colt Mask, a bay son of prominent sire Tapit that romped to a 6 ¼-length victory in the Mucho Macho Man Jan. 6 in his 3-year-old debut to make him a perfect 2-0. This entry was posted in NL List, Pegasus World Cup and tagged Chad Brown, coolmore, Curlin, Gulfstream, gulfstream park, keeneland november, mask, palm meadows, Pegasus, pegasus world cup, shagaf, stellar wind by Press Release. Bookmark the permalink.